Art is the one thing that speaks to everyone. Art transcends time and ties us all together as the human race. Inspired in part by the work of the incredible Daniel Wurtzel, we developed an interactive installation for Viva! Events’ client, United Methodist. Sheer fabric mysteriously danced on its own above a stage, drawing people into the room with light, color and movement. As people gathered around the moving kinetic sculpture, they saw a colorful ribbon/prayer wall with student portraits, were invited to write their own prayers, pray for someone else and read inspiring stories of higher education and faith in action. Event attendees add their creative paint drips to this large butterfly painting to be auctioned for the benefit of 5 charities at this annual event. We created an interactive installation on the impressive cylindrical Mediatheque wall for the opening of PNCA’s flagship campus, the new Arlene and Harold Schnitzer Center for Art and Design. 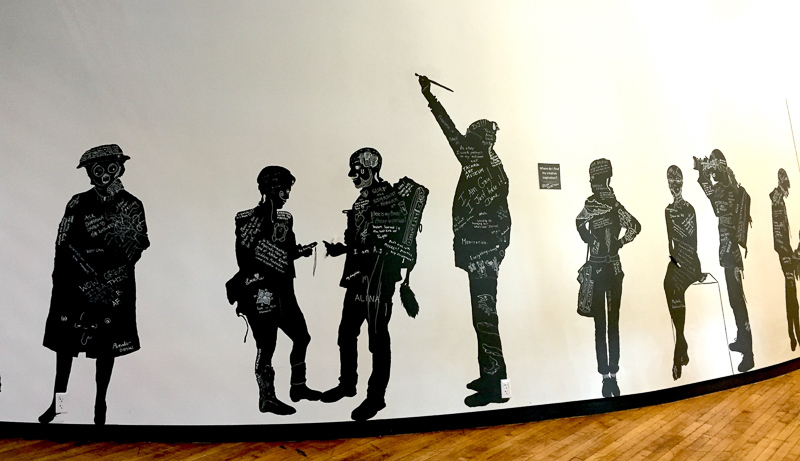 56 life-size painted silhouettes depicted PNCA art students, teachers, staff and supporters. The community was invited to write their personal creative stories and advice onto the figures. These insightful and sometimes unexpected words added a sense of discovery making the whole wall an adventure to read. Montessorians from around the world added their values, learnings, reflections and artistic color to 5 beautiful panels complimenting their nature theme. The finished panels hang in the Portland Montessori office.